The yorkshire terrier (most known as the "yorkie") is the most popular toy dog breed in North America. Like many small dogs, the yorkies often see themselves as a large dog in a small body. They are loyal to their family but take a while to accept strangers and unfamiliar dogs. Yorkies are intelligent and easy to train dogs, however they can be easy to spoil so it's recommended to set limits when giving treats. The breed makes an excellent companion dog and can suffer from separation anxiety if left home alone for long periods of time. Below are the characteristics and traits of the Yorkshire Terrier dog breed. The yorkshire terrier is one of the most popular toy dog breeds and since many people desire the smallest yorkies it's not uncommon for the breed to be as small a four pounds. Generally the breed is 8-10 inches tall and weighs less than seven pounds. 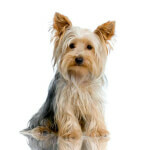 Yorkies make great companion dogs and want to be with their family as often as possible. As a terrier, the breed has an adventurous spirit which can vary between being perky and friendly to mischievous and trouble making. They can be spoiled easily, so it's recommended to limit treats to keep rewards a positive surprise rather than an expected ritual. They can be timid towards strangers and unknown dogs, so it's recommended to socialize them when they're younger so they develop into a more well rounded adult. 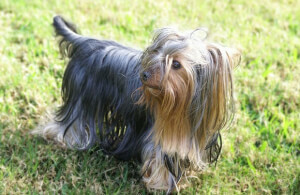 Yorkshire terriers are well known for their long silky coats. Their fur is naturally straight and owners of show dogs will frequently avoid cutting their yorkies fur and let it reach the ground. The breed is considered a high maintenance breed and will require daily brushing to keep their hair straight and free of tangles. The Yorkshire Terrier is one of the best-known lap dogs in the Western world, and she is coveted by royalty, carried by celebrities and pampered as if she's both. It wasn't so long ago that she was none of this, however, for she didn't exist until the middle of the 19th century. Nevertheless, the Yorkshire Terrier history is a short but action-packed one. While the name may make you think it's silly to wonder where Yorkies are from, it's not so simple as Yorkshire, England. This dog and her forebears were used by miners, millers and factory workers in England for the grubby gig of rat-catching — a dirty job but one that was absolutely required in the early, dirty and disease-ridden days of the Industrial Revolution. She was neither the first nor the only dog to be put to this task. There were a number of breeds that were crossed to produce the Yorkshire Terrier, and most of these breeds came from Scotland. As factories in England opened en masse, they needed workers. As those workers moved from rural areas to cities such as Yorkshire, they took with them dogs that were small, manageable and could fulfill a number of roles. From this plethora of Terriers there were thought to have been three that were primarily used to produce the Yorkie: Clydesdale, Paisley and Skye Terriers. To be sure, the Yorkshire Terrier origin was a multifaceted one, and many of the above dogs may have had a part in the Yorkie being born. While it's unknown who, how and exactly where all of this cross-breeding took place to create the basic breed we now dotingly call the Yorkie, it is said that the father of the breed was established by a "broken-haired Scotch Terrier" named Huddersfield Ben, born in 1865. 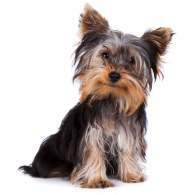 Although "Ben" quickly became a popular show dog, the name "Yorkshire Terrier" wasn't coined until 1870. That year, after the Westmoreland Dog Show, a magazine titled The Field ran a piece by Angus Sutherland wherein he wrote, "They ought no longer to be called Scotch Terriers, but Yorkshire Terriers for having been so improved there." The name stuck, and the dog's popularity grew quickly and against great odds, for her humble beginnings ignited distaste in the very Victorian nobility that would soon enough adopt the breed. Four years later, in 1874, the Yorkie made it into the British Kennel Club stud book. Across the pond, Yorkie history in the Yankee world was equally remarkable. The first recorded birth of a Yorkie in the U.S. occurred in 1872, and by 1878 the breed was in dog shows. 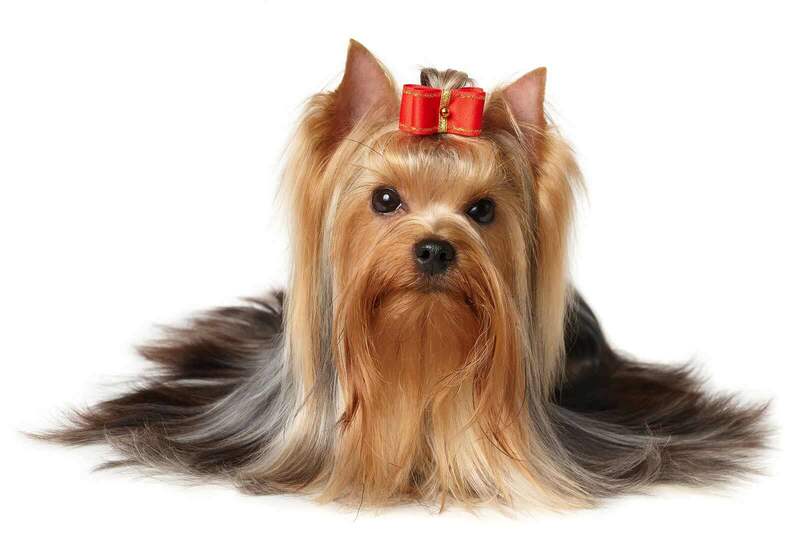 A few years later, in 1885, the AKC formally recognized the Yorkshire Terrier. 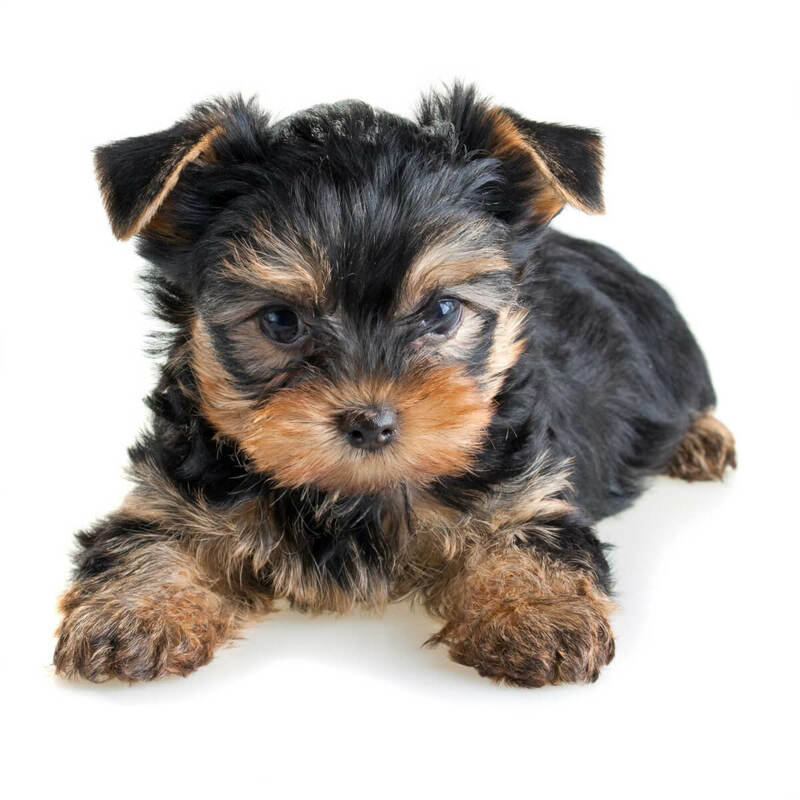 The popularity of the Yorkie exploded practically overnight when the dog was bred down in size to be approximately 5 pounds, give or take a pound or two. (The first Yorkshire Terriers, in the UK, were considerably larger at 12 to 14 pounds.) To this day, the Yorkie remains an extremely popular — and expensive — purebred dog. 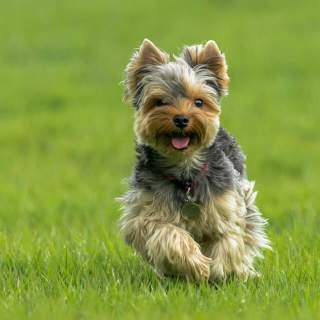 The first and foremost aspect of a Yorkie is her gait: although ranging in size from tiny to tinier, she will walk most anywhere and everywhere as if she owns it. No matter if she has the typical puppy cut, the very rare full-blown show coat or something between — her swagger will be cocky. You'll notice her ears: pointy, perky and alert. Her cute little black eyes set in a small and slightly flat will complement her slight body; blue-eyed Yorkies are very rare and this often displays as heterochromia or with other genetic defects. The Yorkshire Terrier tail tends to be docked to a stub that should be approximately half its original length (undocked is more humane). Yorkie coats can be short, medium or very long, but the hair is always silky and the golden-black sheen is a wonder to behold when nicely groomed. Below are the standard coat colors of the Yorkshire Terrier dog breed. The original Yorkshire Terrier of the mid-19th century, while still small, was a much larger dog at about 12 pounds. 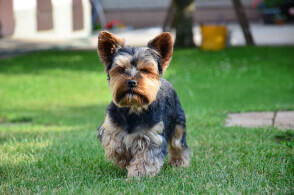 While there is no definitive Yorkie weight chart, the previous AKC standard held that a Yorkie had a minimum weight of 4 pounds. That has since been eliminated, and now the Club lists only a maximum weight: 7 pounds. There are those Yorkies that exceed this, of course, although not by much. It is not entirely unusual for some to be 8 to 10 pounds. While there is no height standard (the AKC only considers weight with regard to Yorkie size), the typical Yorkie is about 6 to 9 inches high. These days, there is a desire for ever-smaller full-grown Yorkies. "Teacup Yorkies" generally are advertised as weighing up to 3-4 pounds and standing 5-6 inches; while these may look cute it is dangerous to the health of these dogs to be bred down to such a size. The AKC has a somewhat strict standard when it comes to Yorkshire Terriers, but that standard is also a bit open-ended. Because there is no mininum weight set by the AKC, there has been a great push to make these dogs alarmingly small. Along with size variations, there are color varieties and even one breed that has emerged from such production which has been informally recognized by the AKC. There are also color types that breeders — but not the AKC — have named. Color, which tends to come with a great amount of contention, is another way that Yorkies tend to be popularly grouped. The AKC recognizes only four colors: black and tan, black and gold, blue and gold, and blue and tan. Many people proclaim that there are separate varieties such as the Golden Yorkie, the Chocolate Yorkie, the Red Yorkie and the Silver Yorkie. These single-color rarities — along with the even more rare Red-legged Yorkshire Terrier — are indeed Yorkies but are considered "mismarked." There is also the emergent breed that is somewhat a variety, the Biewer Terrier. This dog, which has been in the AKC's FSS Program since 2014, came from a hybrid dog, the Parti Yorkie. The Yorkie temperament is both boon and bane; these dogs may be small but they are a bundle of responsibility! They are demanding, insistent, loving, inquisitive and demanding — so much so it needs to be stated twice! One funny Yorkie personality trait is that she doesn't understand her diminutive size, and while you do have to make for a few allowances, one thing you cannot allow is for her to control you. Setting this precedent may have life-long repercussions regarding Yorkie behavior. Through it all, however, her unending devotion, guard-doggedness and desire to please you should be appreciated. She'll be there for you but you must be there for her lest she develop separation anxiety, destructive habits and non-stop yapping. House-training is sure to be one of the most difficult parts of the Yorkshire Terrier temperament. These petite pups are known to favor neither rain nor isolation, and this can make outdoors potty trips nearly impossible and crate-training all but intolerable. Still, the rewards for undertaking all this is having a beautiful, loving and gracious Yorkie who will be there for you all the time! If you want your household to be home to a Yorkie family, there are a few things to first consider carefully. Very young children can create a catastrophic place for these dogs. There is a significant possibility of harm if irritated dogs bite during playtime, careless kids who step on or drop these little dogs, and other hazards. A Yorkshire Terrier and kids who are older are best. As for Yorkies and babies, there tend to be few problems since babies shouldn't be left unattended. 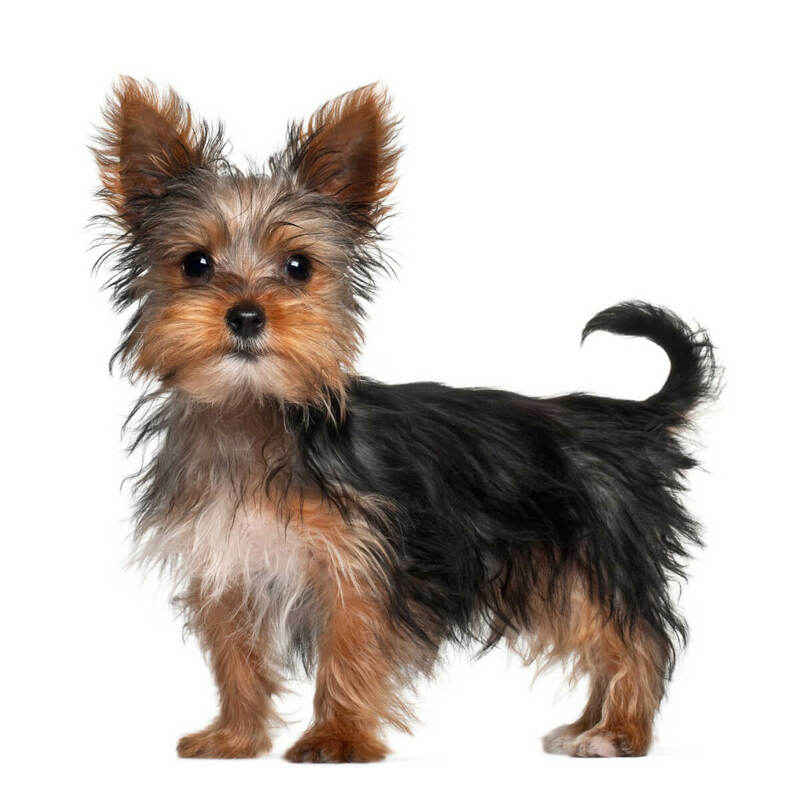 Questions abound regarding this breed and other pets and animals: Are Yorkies good with other dogs? How do Yorkies and cats get along? What if I live where there are lots of squirrels? If you are considering adopting a Yorkshire Terrier, you must know the answers. 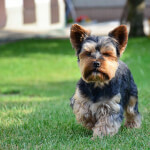 Understanding the historic demeanor of Yorkies is one aspect that must never be forgotten. This breed was literally made for hunting down, catching and killing rodents in hostile, small and dangerous environments. Because of this, it is not at all unusual for a Yorkie to take on a much larger dog, to ignore everything you say and bolt after a squirrel or rabbit, or — if not properly trained — start a spat with your cat. Many people may be most concerned with their Yorkshire Terrier and cats. If you wish to share your home with a Yorkie and a cat (or cats), early, patient and constant socialization will greatly help to prevent dust-ups. Below are pictures of the Yorkshire Terrier dog breed. These little dogs are very curious, rather demanding and forever on the move. They are a bit protective and as such may bark a lot as well as be highly suspicious of strangers or friends they've just met. They don't like to be left alone and will accompany you everywhere. Separation anxiety is a sure thing if you are gone frequently and / or on long trips. Although the breed can adapt well enough to most any house, the preferred home is an indoor one. 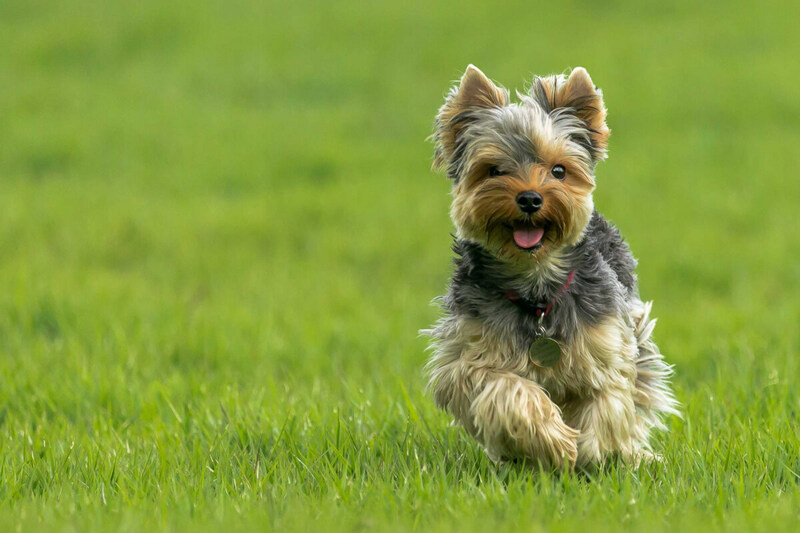 Yorkshire Terriers are great apartment-only dogs (with a bit of daily exercise, of course). If you do have a yard and like to let them outdoors, however, be aware that these dogs have a strong instinct to chase rodents and small animals. They will take off after mice, squirrels and cats, and they will roam. But the big question about this small dog tends to be: Is the Yorkshire Terrier hypoallergenic? When it comes to Yorkies and allergies, those who have the latter and want the former will be happy to know that Yorkies are indeed hypoallergenic. They don't have fur, and their hair sheds very little. One nickname for a Yorkie is "the Tomboy Toy." These dogs are popular with women, but they also excel at "un-ladylike" activities like agility trials and dog sports--hence the "tomboy" nickname. Yorkshire Terriers are considered by many to be ugly dogs. In fact, a horrendously ugly Yorkie normally places high (or low, depending on how you look at it) in the annual World's Ugliest Dog competition in Petaluma, CA. A Yorkie's fur is texturally similar to human hair. 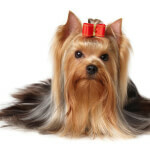 Yorkie coats need frequent brushing, just like humans' hair; some owners actually use only human shampoo on their dogs. 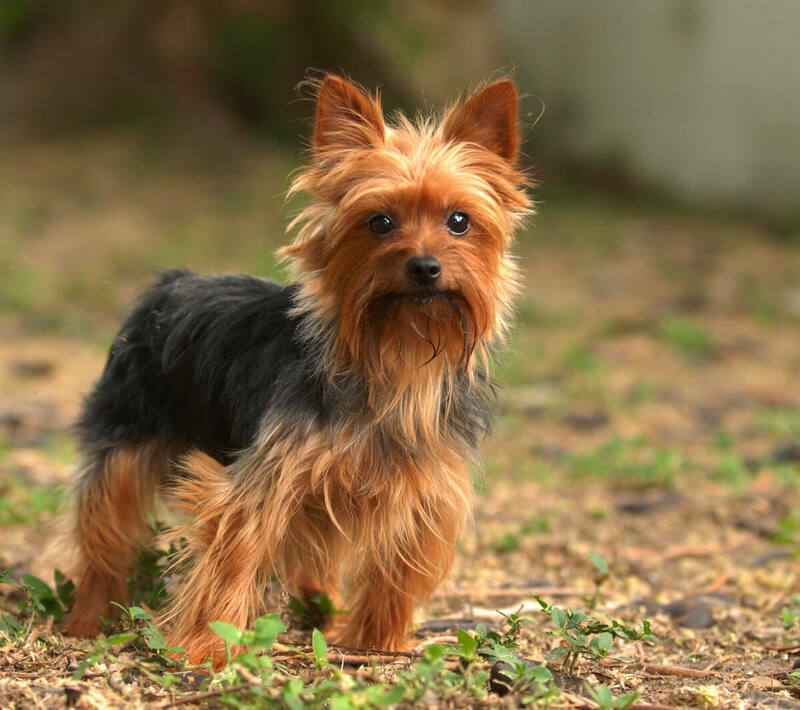 A Yorkshire Terrier holds the record for being the smallest dog in recorded history. A dog named Sylvia, owned by an English man named Arthur Marples in the 1940s, stood only 2.5 inches tall and weighed less than half a pound. That strange honking sound some Yorkies make? It's called reverse sneezing. Also called "pharyngeal gag reflex," some dogs of this breed "honk" and wheeze from a spasm in the laryngeal area. But don't be alarmed--reverse sneezes are as harmless as regular ones.